Heteropolysaccharides are the polysaccharides that comprise of two or more various kinds of monosaccharides. They comprise chitin, agar and alginic acid. Arabinoxylans are the polysaccharides found in the bran of grasses and grains like rye, wheat and barley. Arabinoxylans comprise of a xylan backbone having L-arabinofuranose (that is, L-arabinose in its 5-atom ring form) linked arbitrarily via 1α→2 and/or 1α→3 linkages to the xylose units all through the chain. As xylose and arabinose are both pentoses, Arabinoxylans are generally categorized as pentosans. Arabinoxylans are important in the baking industry. The arabinose units bind water and make viscous compounds which influence the consistency of dough, the retention of gas bubbles from fermentation in gluten-starch films and the final texture of baked products. Chitin is the unbranched polymer of N-Acetyl-D-glucosamine. This is found in fungi and is the main component of arthropod and lower animal exoskeletons, example: crab, insect and shrimp shells. 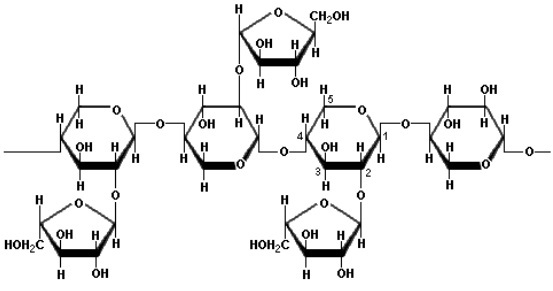 This might be regarded as a derivative of cellulose, in which the hydroxyl groups of the second carbon of each glucose unit have been substituted by acetamido (-NH(C=O)CH3) groups. Glycosaminoglycans are mainly found in the lubricating fluid of the joints and as components of cartilage, vitreous humor, synovial fluid, bone and heart valves. Glycosaminoglycans are long unbranched polysaccharides having repeating disaccharide units which have either of two amino sugar compounds -- N-acetylgalactosamine or N-acetylglucosamine and a uronic acid like glucuronate (that is, glucose where carbon six prepares a carboxyl group). Glycosaminoglycans are negatively charged, extremely viscous molecules at times termed as mucopolysaccharides. The physiologically most significant glycosaminoglycans are dermatan sulphate, hyaluronic acid, chondroitin sulphate, heparin, heparan sulphate and keratan sulphate. Chondroitin sulphate is comprised of β-D-glucuronate joined to the third carbon of N-acetylgalactosamine-4-sulphate as described here. Heparin is the complex mixture of linear polysaccharides that encompass anticoagulant properties and differ in the degree of sulphation of the saccharide units. Agar (agar agar) is extracted from the seaweed and is employed in numerous foods as a gelling agent. 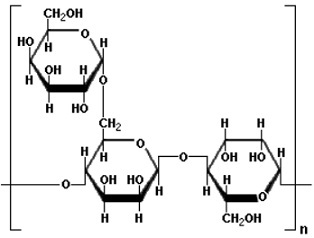 Agar is a polymer of agarobiose, a disaccharide comprised of D-galactose and 3, 6-anhydro-L-galactose. Highly refined agar is employed as a medium for culturing bacteria, cellular tissues and for DNA fingerprinting. Agar is employed as an ingredient in desserts in Japan and other Asian countries. The gels prepared with agar encompass a crispier texture than the desserts made by animal gelatin. Carrageenan is a generic word for some polysaccharides as well extracted from sea-weed. Carrageenan compounds vary from agar in that they encompass sulphate groups (-OSO3-) in place of some hydroxyl groups. Carrageenan is as well employed for thickening, suspending and gelling food products. Alginate is extracted from seaweeds, like giant kelp (that is, Macrocystis pyrifera). The chemical constituents of alginate are arbitrary sequences of chains of β-D-mannuronic and α-L-guluronic acids joined by 1→4 linkages. Alginates are insoluble in water, however absorb water readily. They are helpful as gelling and thickening agents. Alginates are employed in the manufacture of paper, textiles and cosmetics. The sodium salt of alginic acid, sodium alginate, is employed in the food industry to raise the viscosity and as an emulsifier. Alginates are found in the food products like ice-cream and in slimming aids where they serve up as appetite suppressants. In dentistry, alginates are employed to make dental impressions. Guar is a legume which has been traditionally cultivated as livestock feed. Guar gum is as well acknowledged by the name cyamopsis tetragonoloba which is the Latin taxonomy for the guar bean or cluster bean. Guar gum is the ground endosperm of the seeds. 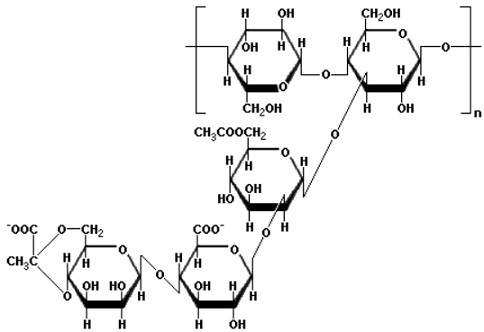 Around 85 percent of guar gum is guaran, a water soluble polysaccharide comprising of linear chains of mannose having 1β→4 linkages to which galactose units are linked by 1α→6 linkages. The ratio of mannose to galactose is 2:1. Guar gum consists of five to eight times the thickening power of starch and has numerous uses in the pharmaceutical industry, as a food stabilizer and as a source of the dietary fiber. Pectin is the polysaccharide which acts as a cementing material in the cell walls of all plant tissues. The white part of the rind of lemons and oranges includes around 30 percent pectin. Pectin is the methylated ester of polygalacturonic acid that comprises of chains of 300 to 1000 galacturonic acid units linked by 1α→4 linkages. The Degree of Esterification (DE) influences the gelling properties of pectin. The structure illustrated here consists of three methyl ester forms (-COOCH3) for each and every two carboxyl groups (-COOH), therefore consists of 60% degree of esterification, generally termed as a DE-60 pectin. Pectin is a significant ingredient of fruit preserves, jams and jellies. Xanthan gum is a polysaccharide having a β-D-glucose backbone such as cellulose; however each and every second glucose unit is linked to a trisaccharide comprising of mannose, glucuronic acid and mannose. The mannose closest to the backbone consists of an acetic acid ester on carbon 6, and the mannose at the end of the trisaccharide is linked via carbons 6 and 4 to the second carbon of pyruvic acid. Xanthan Gum is prepared by the bacterium Xanthomonas campestris that is found on cruciferous vegetables like cabbage and cauliflower. The negatively charged carboxyl groups on the side chains causes the molecules to form extremely viscous fluids whenever mixed by water. Xanthan gum is employed as a thickener for sauces, to prevent ice crystal formation in ice-cream, and as a low-calorie replacement for fat. Xanthan gum is often mixed by guar gum as the viscosity of the combination is more than when either one is employed alone. Glucomannan is a dietary fiber acquired from tubers of Amorphophallus konjac cultivated in Asia. Flour from the konjac tubers is employed to make Japanese shirataki noodles, as well termed as konnyaku noodles, which are very low in calories. Glucomannan is employed as a hunger suppressant as it generates a feeling of fullness by making very viscous solutions which retard absorption of the nutrients in food. One gram of this soluble polysaccharide can absorb up to 200 ml of water, therefore it is as well employed for absorbent articles like disposable diapers and sanitary napkins. The polysaccharide comprises of glucose (G) and mannose (M) in a proportion of 5: 8 linked by 1β→4 linkages. The fundamental polymeric repeating unit consists of the pattern: GGMMGMMMMMGGM. Short side chains of 11-16 monosaccharides take place at intervals of 50 to 60 units of the main chain linked by 1β→3 linkages. As well, acetate groups on carbon 6 take place at each and every 9-19 units of the main chain. Hydrolysis of the acetate groups prefers the formation of intermolecular hydrogen bonds which are responsible for the gelling action. Some of the plants store carbohydrates in the form of inulin as a substitute, or in addition, to starch. Inulins are present in lots of fruits and vegetables, comprising onions, garlic, leeks, asparagus, bananas, chicory and Jerusalem artichokes. Inulins, as well termed as fructans are polymers comprising of fructose units which typically encompass a terminal glucose. 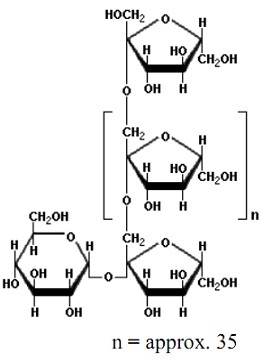 Oligofructose consists of the similar structure as inulin, however the chains comprise of 10 or fewer fructose units. Oligofructose has around 30 to 50 percent of the sweetness of table sugar. Inulin is less soluble than oligofructose and consists of a smooth creamy texture which gives a fat-like mouthfeel. Inulin and oligofructose are non-digestible via human intestinal enzymes; however they are completely fermented via colonic microflora. The short-chain fatty acids and lactate prepared via fermentation contribute 1.5 kcal per gram of inulin or oligofructose. Inulin and oligofructose are employed to substitute fat or sugar and decrease the calories of foods such as ice-cream, confections, dairy products and baked goods.